Those who know me know that I’m a little ape for bananas. I have been eating them daily and feeling better than ever. I recently found out that they are actually classified as a berry (?! ), which makes me love them even more. One of my top 10 foods, bananas contain high levels of tryptophan, which is converted into serotonin (the “happy” neurotransmitter). They also contain magnesium and B-vitamins which all play a role in a relaxed, calm mood. They are high in potassium which can reduce the risk of osteoporosis and kidney stones (by minimizing calcium excretion). As I am not getting calcium from dairy sources I want all of my plant-based calcium to stay inside!! Bananas are easily digested and provide a quick burst of pure, clean energy. They are affordable, accessible and come with their own little bio-degradable packaging. Due to these factors and their nutrient density I consider them to be one of nature’s perfect foods. Make sure your bananas are nice and spotty. There should be no green on them. As they develop spots the starches in the bananas turn to sugars making them easy to digest. If you have had trouble with bananas in the past, try again with spotty ones. I’m sure you’ll be able to tolerate them much better. I buy them by the box 🙂 Make friends with your grocer. You can often buy bulk at a reduced cost. You can also find interesting varieties. 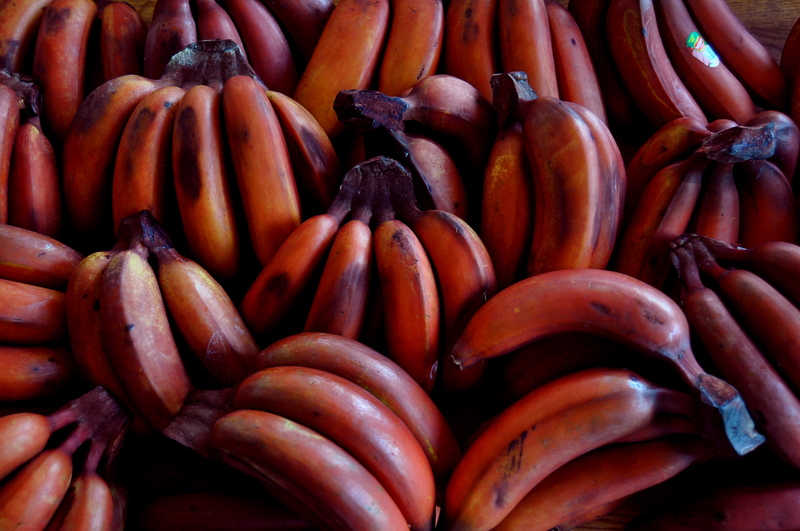 I picked up a case of these red bananas and have been enjoying their unique flavour. I devour mine pretty quickly, but when they are getting a little too ripe, I peel them, put into Ziplock bags and freeze. They sit happily in the freezer waiting to be whipped into a simple ice-cream (recipe here) or used in smoothies. Adding a frozen rather than fresh banana to any smoothie recipe creates a creamy, delicious texture that rivals a milkshake. Blend, using enough water to create a creamy texture. If using fresh bananas add 4-5 ice cubes in place of some of the water. Drink, knowing that you are doing something amazing for your body! 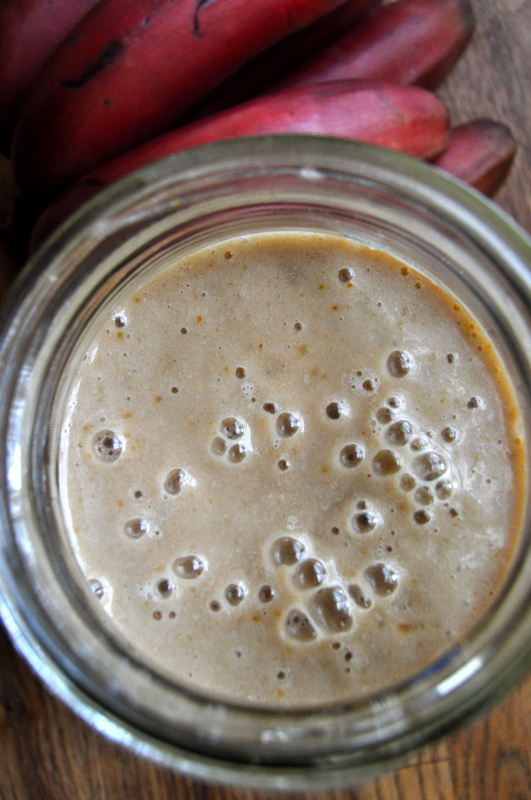 This entry was posted in juice, raw, smoothie, vegan and tagged 80-10-10, bananas, dairy free, dates, easy, gluten free, healthy, high carb, paleo, quick, raw, summer, Tags (optional, vegan, vegetarian. Bookmark the permalink.